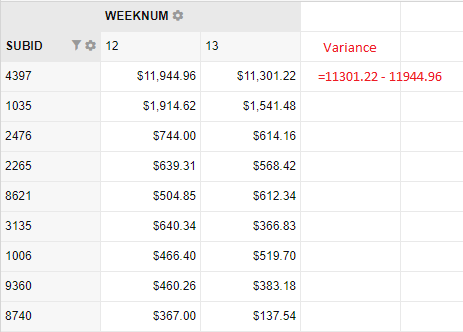 We are trying to show the week over week performance, and would like show the change in Revenue as a 3rd column. See attached. is there a way to accomplish this on the fly using the pivot? Thank you for your question. Please find the jsfiddle example here – http://jsfiddle.net/flexmonster/a7Ljxbry/. The general idea to achieve such behavior is to set Difference aggregation for Revenue measure and also create calculated value from sum(Revenue).